Keurig are a Massachusetts company that make a popular range of Single Cup Coffee Makers using K-Cup technology to produce a perfect gourmet cup of coffee at home. They've now licenced their technology to other coffee manufacturers like Cuisinart and Breville, so you can choose from a range of K-Cup machines. This page aims to review all brands of coffee makers that use K-cup technology. You insert the k-cup of your choice into the top of the machine, fill the water tank with water, select the size of the cup you want made and then start the brewing process. The brewer then heats up the water and punctures small holes into the top and bottom of the k-cup. Hot presurized water is then forced into the cup. Inside each k-cup is a paper filter holding the coffee and an air gap underneath between the filter and the bottom of the cup. The water passes through the coffee and then through the filter to emerge into the gap at the bottom, where the holes punctured into the cup allow the coffee to emerge. The beauty of this system is that the cups are pre-measured, so you can't accidently put in too much or too little coffee (using the wrong amounts is the main reason most home brewed coffee doesn't taste as good as that found in a coffee bar). K-cups come in hundreds of different varieties of coffee (and tea and hot chocolate). Once your coffee is brewed, you simply remove the cup and dispose of it, which means there is less mess making coffee with this brewer than with other types of coffee maker. Keurig B60 Special Edition Single Cup Coffee Maker: This has a 48 ounce reservoir and you can brew three different sizes of coffee: 5.25 ounces, 7.25 ounces, and 9.25 ounces. 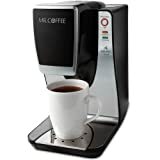 Keurig B70 Platinum Single Cup Coffee Maker: This has a 60 ounce reservoir with the option of brewing five different sizes of cup ranging from 3.25 ounces to 11.25 ounces. It has an iced beverage setting so you can make iced coffee if you want. 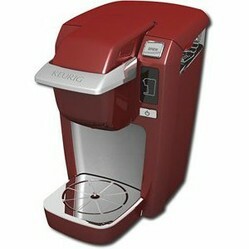 Keurig B30 Mini Coffee Maker: This comes in two colors, black and red. The water tank is small - it's just enough to brew a single 8 ounce cup of coffee. It's for those who don't have a lot of space in their kitchens or who just need to brew a single cup. Mr Coffee make a small brewer powered by Keurig technology (i.e. it uses k-cups). This machine has an eight ounce capacity, much like the Keurig B30. While it is not as stylish as the Keurig, it compensates by being cheaper. The Cuisinart SS-700 is also powered by Keurig technology. It has a large 80 ounce water reservoir, charcoal water filter, and offers five different cup sizes: from 4 ounces to 12 ounces. It has an iced beverage setting and they throw in a re-usuable k-cup coffee filter and a 12 k-cup portion pack. The Breville BKC700XL has a 60 ounce water tank, a charcoal water filter, can brew five different cup sizes and can make iced tea and coffee. It is made from stainless steel. Breville also include a re-usuable K-cup and a sample variety pack. This model has a 1500 watt pump, which means it can make really good quality espressos. It comes with a 1 year limited warranty. If you want the works (five cup sizes, water filter and so on), go for the Breville. It is made of sturdy stainless steel, unlike the Keurig B70 which is plastic. And the power of it's pump means it makes really high quality coffee. If you want a mini brewer, then I would choose the Keurig B30. You may also be interested in the following pages on tassimo coffee makers, other single cup coffee makers , thermos bottles and on stainless steel coffee presses. Choose a strongish blend of coffee - the Green Mountain Extra Bold Dark Magic works well. Put your coffee and cream k cups into the machine. Next, put caramel and vanilla in your cup, together with chunks of ice, and then place the cup on the cup stand. Next set the machine to make coffee. The coffee will drip into the cup as required. This is known as the "brew over ice" technique. The reason you need a strong blend of coffee is that the ice will dilute the coffee. I have that red Keurig Mini, and I love it! Saw your article with its picture and I just had to come here and see what you said about it.